The collapse of the communist bloc headed by the Soviet Union in the early 1990s marked the failure of communism after almost a century. However, the CCP unexpectedly survived and still controls China, a nation with one-fifth of the world’s population. An unavoidable question arises: Is the CCP today still truly communist? No one in today’s China, including Party members, believes in communism. After 50 years of socialism, the CCP has now adopted private ownership and even has a stock market. It seeks foreign investment to establish new ventures, while exploiting workers and peasants as much as it can. This completely opposes the ideals of communism. No one in today’s China believes in communism. “The leopard has died, but its skin is still left.” Today’s CCP only has “its skin” left. The CCP inherited this skin and uses it to maintain its rule over China. What is the nature of the skin inherited by the CCP, that is, the very organization of the CCP? The Communist Party is significantly different from any righteous religion. All orthodox religions believe in God and benevolence, and their purpose is to instruct humanity about morality and to save souls. The Communist Party does not believe in God and opposes traditional morality. What the Communist Party has done proves itself to be an evil cult. The Communist Party’s doctrines are based upon class struggle, violent revolution, and the dictatorship of the proletariat and have resulted in the so-called “communist revolution” full of blood and violence. The red terror under communism has lasted for about a century, bringing disasters to dozens of countries and costing tens of millions of lives. The communist belief, one that created a hell on earth, is nothing but the vilest cult in the world. The Communist Party holds up Marxism as its religious doctrine and shows it off as the unbreakable truth. The doctrines of the Communist Party lack benevolence and tolerance. Instead, they are full of arrogance. Marxism was a product of the initial period of capitalism when productivity was low and science was underdeveloped. It didn’t have a correct understanding at all of the relationships between humanity and society or humanity and nature. Unfortunately, this heretical ideology developed into the international communist movement and harmed the human world for over a century before the people discarded it, having found it completely wrong in practice. Party leaders since Lenin have always amended the cult’s doctrines. From Lenin’s theory of violent revolution, to Mao Zedong’s theory of continuous revolution under the dictatorship of the proletariat, to Jiang Zemin’s “Three Represents,” the Communist Party’s history is full of such heretical theory and fallacy. 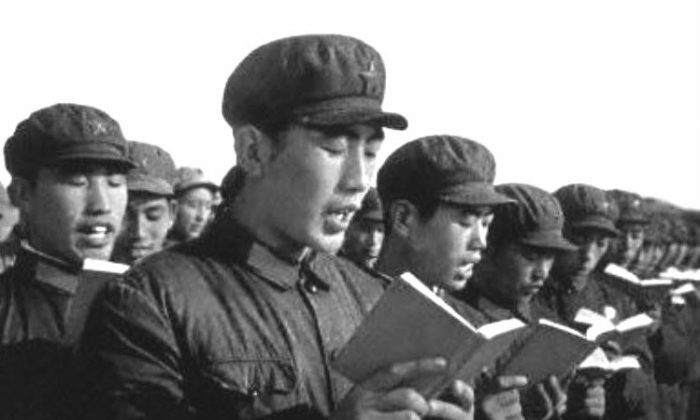 Although these theories have constantly caused disasters in practice and are self-contradictory, the Communist Party still proclaims it is universally correct and forces the people to study its doctrines. Eliminating dissidents is the most effective means for the evil cult of communism to spread its doctrine. Because the doctrine and behavior of this evil cult are too ridiculous, the Communist Party has to force people to accept them, relying on violence to eliminate dissidents. After the CCP seized the reins of power in China, it initiated land reform to eliminate the landlord class, socialist reform in industry and commerce to eliminate capitalists, the movement of purging reactionaries to eliminate folk religions and officials who held office before the communists took power, the Anti-Rightist Movement to silence intellectuals, and the Cultural Revolution to eradicate traditional Chinese culture. In the period after Mao’s and Deng’s reigns, the CCP asserted that Falun Gong, a traditional cultivation practice that believes in truthfulness, compassion, and tolerance, would compete with it for the masses. It therefore intended to eradicate Falun Gong and initiated a genocidal persecution of Falun Gong, which continues today. The Party also spoke outrageously about the thought of the “Three Represents,” although in this case, actually mocking it when saying it is a continuation and development of Marxism-Leninism, Mao Zedong thought, and Deng Xiaoping theory. Stalin’s wanton slaughter of innocent people, the catastrophic Cultural Revolution launched by Mao Zedong, Deng Xiaoping’s order for the Tiananmen Square massacre, and Jiang Zemin’s ongoing persecution of Falun Gong are the dreadful results of the Communist Party’s heretical dictatorship. On the other hand, the CCP Charter stipulates that the CCP is the core of the leadership for the Chinese-featured socialist cause, overriding both the country and the people. The chairman of the Standing Committee of the National People’s Congress made “important speeches” across the country, claiming that the National People’s Congress, the highest organ of state power, must adhere to the CCP’s leadership. According to the CCP’s principle of democratic centralism, the entire Party must obey the Central Committee of the Party. Stripped to its core, what the National People’s Congress really insists upon is the dictatorship of the general secretary, which is in turn protected in the form of legislation. The CCP’s organization is extremely tight: One needs two Party members’ references before admission; a new member must swear to be loyal to the Party forever once admitted; Party members must pay membership dues, attend organizational activities, and take part in group political study. If the Party wanted you dead, you could not live; if the Party wanted you alive, you could not die. In those years when class struggle campaigns were carried out, the “priests” of the CCP religion, namely, the Party secretaries at all levels, more often than not, did not know exactly what they did other than disciplining people. The “criticism and self-criticism” in the Party meetings serves as a common, unending means for controlling the minds of Party members. Throughout its existence, the CCP has launched a multitude of political movements for purifying the Party members, rectifying the Party atmosphere, capturing traitors, purging the Anti-Bolshevik Corps (AB Corps), disciplining the Party, and periodically testing the sense of Party nature—that is, using violence and terror to test the Party members’ devotion to the Party, while assuring they keep in step with it forever. Joining the CCP is like signing an irrevocable contract to sell one’s body and soul. With the Party’s rules being always above the laws of the nation, the Party can dismiss any Party member at will, while the individual Party member cannot quit the CCP without incurring severe punishment. Quitting the Party is considered disloyal and will bring about dire consequences. During the Cultural Revolution when the CCP cult held absolute rule, it was well-known that if the Party wanted you dead, you could not live; if the Party wanted you alive, you could not die. If a person committed suicide, he would be labeled as “dreading the people’s punishment for his crime,” and his family members would also be implicated and punished. The CCP promotes violence and has killed countless people throughout its previous political movements. It educates people to treat the enemy “as cold as the severe winter.” The red flag is understood to be red for having been “dyed red with martyrs’ blood.” The Party worships red due to its addiction to blood and carnage. In those frenzied years, “brave words” such as “Fear neither hardship nor death” and “Bitter sacrifice strengthens bold resolve; we dare to make the sun and moon shine in new skies” gave aspirations substance amid an extreme shortage of material supplies. At the end of the 1970s, the Vietcong dispatched troops and overthrew the Khmer Rouge regime, which was fostered by the CCP and committed unspeakable crimes. Although the CCP was furious, it could not dispatch troops to support the Khmer Rouge, since China and Cambodia did not share a common border. Instead, in the name of self-defense, the CCP launched a war against Vietnam along the China-Vietnam border to punish the Vietcong. One hundred and fifty-four Chinese martyrs died in 1981 recapturing Mount Faka in Guangxi Province, but the CCP casually returned it to Vietnam after China and Vietnam surveyed the boundary. When the rampant spread of SARS threatened people’s lives at the beginning of 2003, the CCP readily admitted many young female nurses. These women were then quickly confined in hospitals to nurse SARS patients. The CCP push young people to the most dangerous frontline, in order to establish its “glorious image” according to which one should “Fear neither hardship nor death.” However, the CCP has no explanation as to where the rest of the current 65 million Party members were and what image they brought to the Party. The CCP promotes atheism and claims that religion is the opiate of the people. It used its power to crush all religions in China, and then it deified itself, giving absolute rule of the country to the CCP cult. At the same time that the CCP sabotaged religion, it also destroyed traditional culture. It claimed that tradition, morality, and ethics were feudalistic, superstitious, and reactionary, eradicating them in the name of revolution. During the Cultural Revolution, widespread ugly phenomena violated Chinese traditions, such as married couples accusing each other, students beating their teachers, fathers and sons turning against each other, Red Guards wantonly killing the innocent, and mobs beating, smashing, and looting. These were the natural consequences of the CCP’s smothering human nature. On June 4, 1989, the so-called “People’s Liberation Army” massacred many students in Beijing. This caused the Chinese to completely lose hope in China’s political future. From then on, everyone’s focus turned to making money. From 1999 to this day, the CCP has been brutally persecuting Falun Gong, turning against Truthfulness, Compassion, and Tolerance (the fundamental principles of Falun Gong) and thereby causing an accelerated decline in moral standards. Since the beginning of this new century, a new round of illegal land enclosure and seizure of monetary and material resources by the corrupt CCP officials in collusion with profiteers has driven many people to become destitute and homeless. The number of people appealing to the government in an attempt to have an injustice settled has increased sharply, and social conflict has intensified. Large-scale protests are frequent, which the police and armed forces have violently suppressed. The fascist nature of the “Republic” has become prominent, and society has lost its moral conscience. In the 90s people took advantage of anyone they ran into. The sole purpose of establishing the CCP was to seize power by armed force and then to generate a system of state ownership in which the state holds monopolies in the planned economy. The CCP’s wild ambition far surpasses that of the ordinary evil cults that simply accumulate money. In a country of socialist public ownership ruled by the Communist Party, Party organizations that hold great power (that is, the Party committees and branches at various levels) are imposed upon or possess the normal state infrastructure. The possessing Party organizations control state machinery and draw funds directly from the budgets of the governments at different levels. Like a vampire, the CCP has sucked a huge amount of wealth from the nation. “The leopard has died, but its skin is still left” is from the ancient Chinese book of prophecy, the “Plum Blossom Poem,” by Shao Yong (1011–1077). The leopard here refers to the geographic territory of the former Soviet Union, which indeed resembles a running leopard in shape. With the collapse of the former Soviet Union, the essence of the communist system has disintegrated, leaving only the “skin” (the form), which the Chinese Communist Party inherited. A kind of group dance popular during the Cultural Revolution to show loyalty to Mao and the Party. See a picture of the dance on www.shm.com.cn/yantai/2004-05/13/content_3717.htm. Constitution of the People’s Republic of China (official translation, 1999). From a poem by Sima Qian (about 140–87 B.C. ), a historian and scholar in the West Han Dynasty. His famous poem says, “Everyone has to die; one dies either more solemn than Mount Taishan or lighter than a feather.” Mount Taishan is one of the major mountains in China.